Pours crystal clear golden straw color with a capping of fine white bubbles that make up a creamy head. The smell has that clean graininess that lagers typically have with hints of sulfur and some hints of lemon grass, perhaps some hop notes. It is crisp and mostly grain on the palate with a touch of biscuit and bread as well as just a tinge of hop bitterness. It is slightly sweet as most adjunct lagers go and has a rounded finish. This is a highly drinkable beer. It has a little less zip in the carbonation like a High Life or Pabst Blue Ribbon. There is some malt notes shining through the mediocrity of adjunct flavors. 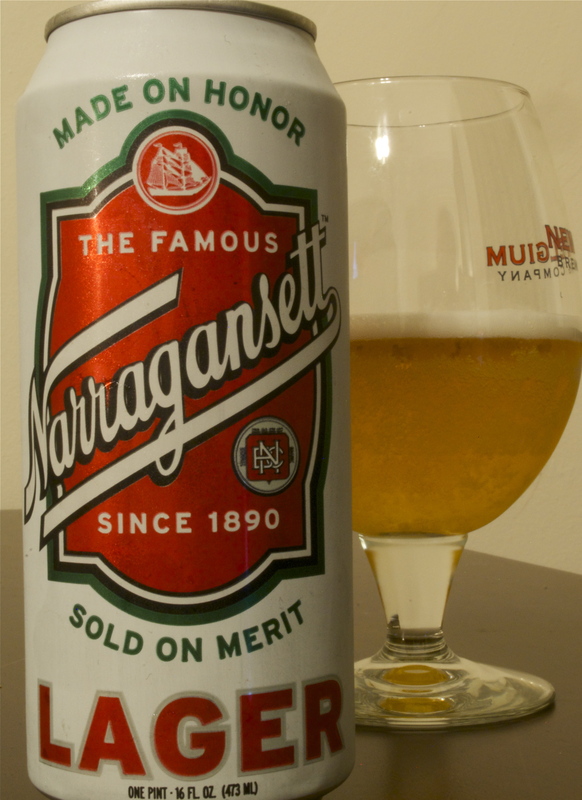 Not surprisingly this is one of the highest rated American Adjunct Lager styles on BeerAdvocate. The Alstrom brothers say that it is better than Schlitz, which is a relative compliment, and they suggest pairing it with calamari with hot peppers truly Rhode Island style. Maybe I’m biased. Maybe it’s the Tom Brady special that’s on TV. Maybe it’s just a great beer.